The moving and inspirational true story of one little girl’s battle against the medical odds and a mother’s unwavering love for her daughter. ‘If I could have any wish it wouldn’t be a part in High School Musical. I’d like to live just one day without having to rest when my heart gets tired: I’d just waste my energy, doing stuff with friends. But I can’t and feeling unhappy about it is a waste of time. Being happy gives me energy – so much so that sometimes I want to do a cartwheel even though I can’t actually manage it. My decision wasn’t about dying. It’s about living.’ When her daughter Hannah was only four years old, Kirsty Jones received the news that no mother ever wants to hear. Her little girl had leukaemia. But Kirsty knew that Hannah was a fighter, and after gruelling chemotheraphy she beat the disease. But there was more trauma to come: the chemotherapy drugs had damaged Hannah’s heart. At first, doctors hoped that Hannah’s body would compensate for the damaged muscle, but when Hannah was only twelve her heart failed without warning. As her life hung in the balance, Doctors advised that Hannah’s only chance of survival was a heart transplant, but the operation was very risky and the anti-rejection drugs might bring back the leukaemia. Kirsty knew one thing: Hannah deserved to decide her own destiny. Wise beyond her years after learning to cope with so much, Hannah made her choice: she did not want the transplant. She’d had enough of hospitals and wanted to be at home with her family. Then in July 2009, the right side of Hannah’s heart completely stopped working and her kidneys started to fail. Days later Hannah celebrated her 14th birthday – a milestone she was never expected to reach – and Hannah was ready to make a different choice. She agreed to have the transplant. Now Kirsty and Hannah tell their unique story and, with wit and honesty, their interweaving voices describe how facing and overcoming death has taught them so much about living. 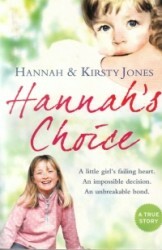 Filled with wisdom and grace, tears and laughter, Hannah’s Choice is about beating the odds and finding joy in each day. An inspirational story about beating the odds, living life to the full and never giving up on life and each other.